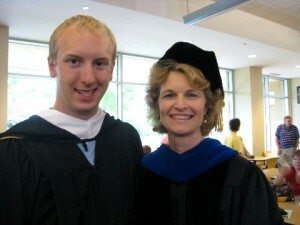 Steven, who grew up in Medina, MN went on to earn a degree in economics and management from Gustavus. Following his graduation in 2010, he took a position as a Merchandise Specialist at Target Corporation in Minneapolis, MN. Steven credits his time at Gustavus with giving him the personal relationships, experience with leadership as well as a rock-solid education with helping him begin and develop his career. As a new alumnus, Steven is actively involved in giving back to his alma mater. He has returned to speak about his work at Target for Assistant Professor Kathi Tunheim’s Organizational Behavior class. Steven, with his parents Richard and Chris, made a gift to support the new academic building. Their gift will honor Steven’s former professor and name her new office space. Gustavus and Kathi Tunheim are honored to be the recipient of the Andres’ generosity. Their support helps ensure a strong and vital future for Gustavus. If you would like to discuss ways to make a similar gift to honor a professor, call the gift planning staff at 800-726-6192.